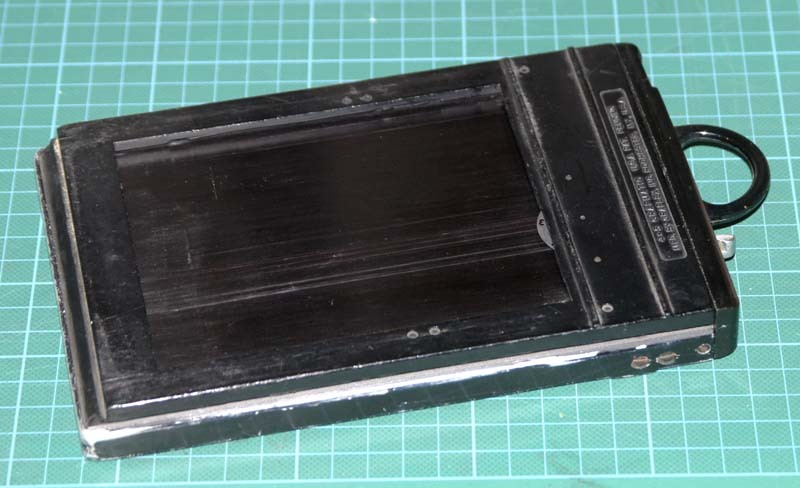 The Grafmatic is a type of film holder that has six sheets of cut film stored in a single compact device. Each sheet of film is held in a metal sheath called a septum and these are shuffled through the Grafmatic as the mechanism is operated. It allows much faster cycling of the sheets than traditional double dark film holder and it also holds the film flatter. The purpose of this page is to allow any easy identification of the different types of Grafmatics and similar looking film holders commonly avilable for sale on line. The Grafmatics were designed by Graflex corp, makers of the famous “Speed Graphic”, and were an evolution of the older Cut Film Magazine or “Bag Mag” which held 12 or 18 sheets of film but were much clumsier to operate. The Bag Mag was avilable in a number of sizes up to 5×7, but Grafmatics were only ever available in 2 1/4 x 3 1/4 or 4×5. 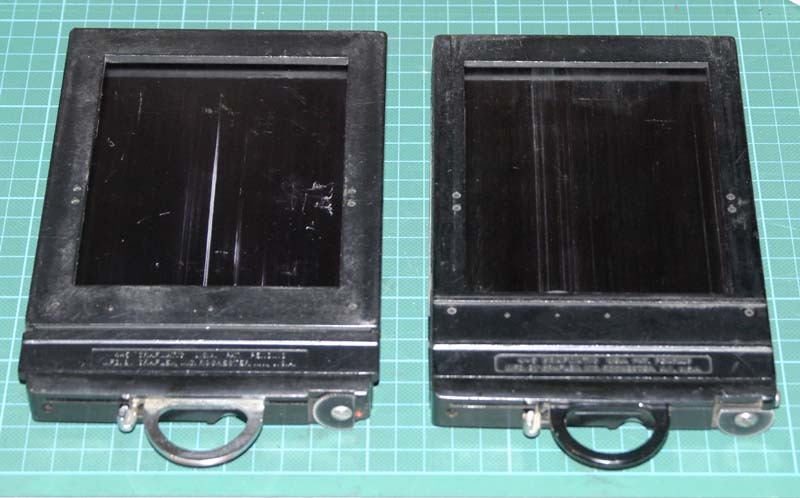 There were two types of 4×5 Grafmatic, one for the Graflok back and the other for the older Graflex back. The Graphic type is slim enough to slip under some spring backs, although not all. 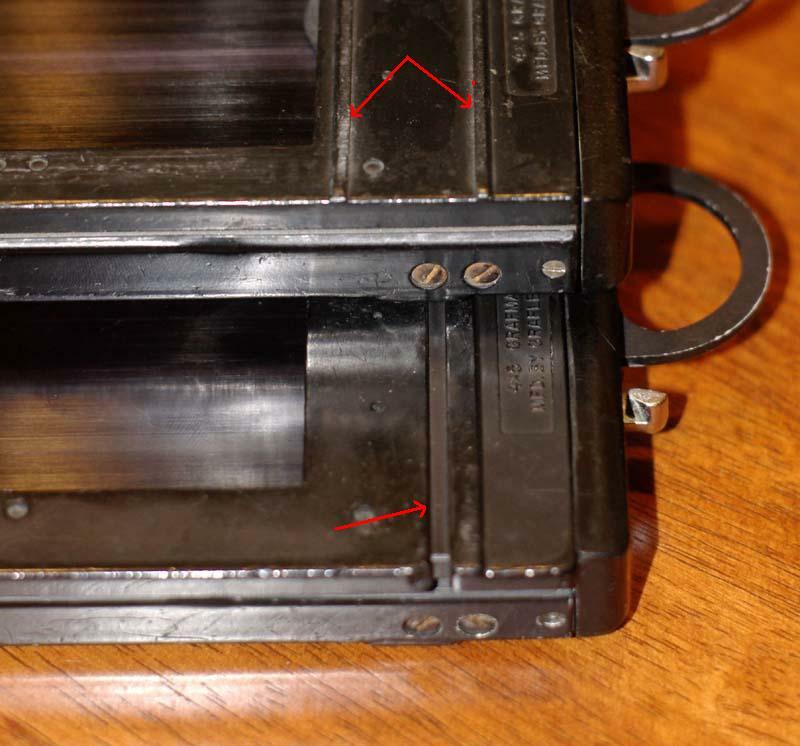 Later versions had an additional “lock up” feature that locked the body solidly after the sixth sheet of film had been used. Most of the Grafmatics produced were the 4×5 “Graphic” versions that fitted the Graflok back fitted to most post war Speed Graphics, Crown Graphics and Super Graphics, not to mention many other cameras fitted with “international backs”. 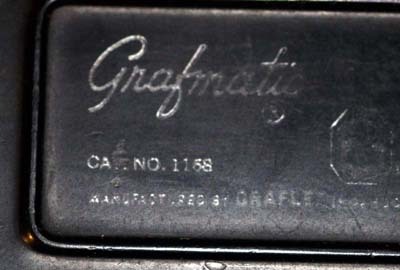 The other sort of Grafmatic is called the “Graflex” type which is very confusing as this is also the name of the company that produced them and is thus printed on the back of both types. The “Graflex” type were made for the older sort of back that is found on many of the Graflex SLRs like the RB, Auto-Graflex, Series D etc and some of the earlier Speed Graphics. For quite a while a Speed Graphic could be ordered with either a Graflok or Graflex back so naturally there was a Grafmatic version available for either. The “Graflex” version is a lot rarer, but as they aren’t really interchangeable it is best to try and identify before you buy. There are two main physical differences between the two types. The “Graflex” back is slightly wider, so the base of the “Graflex” type of Grafmatic flares out at the side, while the “Graphic” type has straight sides. 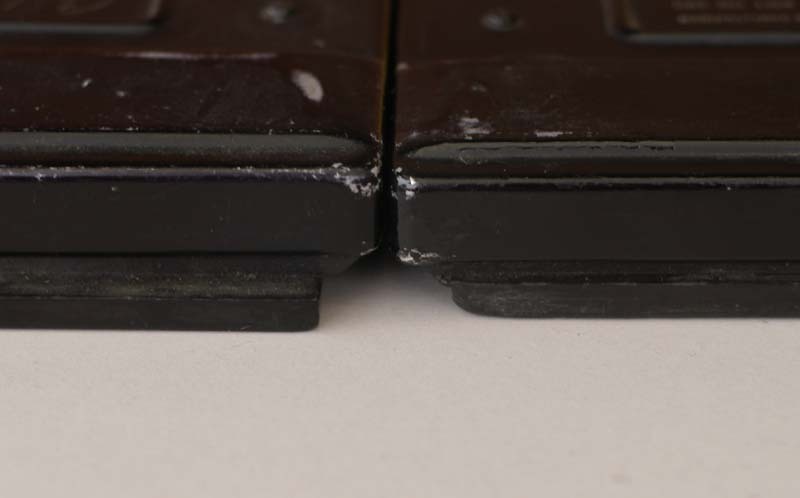 Both types have a groove running the full length of both sides. On the left you can see the wider base of the “Graflex” type, which is also slightly thicker than the “Graphic” type on the right. The second difference is the type of light trap. The “Graflex” back has a single groove on the face near the handle, while the “Graphic” type has two ridges. 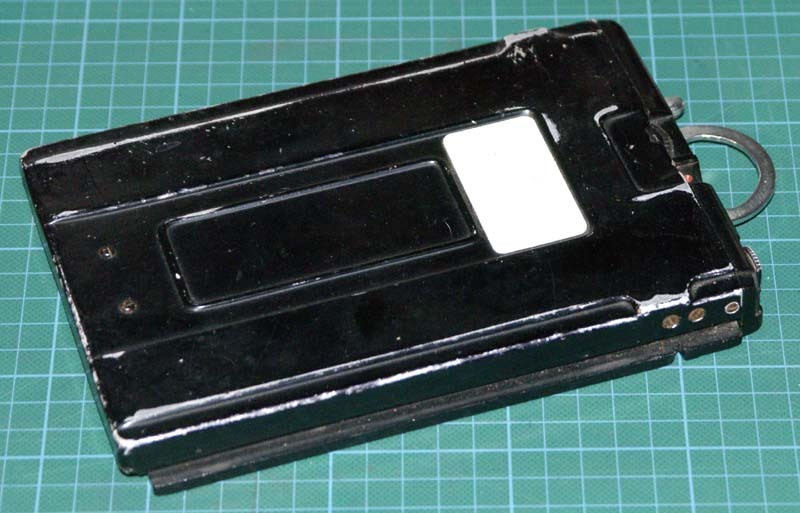 In both cases they act as both a light trap and also a means of stopping the Grafmatic sliding out of the back. Another method of identification is the printing on the back of the Grafmatic. The Graflex type is usually identfied by “45” G R AF L E X or the catalog number 1168. The Graphic type may have “45” G R A P H I C printed on it or may have catalog number 1268 or both. Just beware, the metal “shell” of both sorts are interchangeable and it is possible that parts may have been interchanged from one type to another either as a repair or an upgrade. The only other meaningful difference to be found amongst Grafmatics is between the newer locking and older non-locking versions. In both versions when the counter moves past 6 you get to X, indicating that you have used all of the sheets of film. At this point the dark slide locks in place and you can no longer shuffle between the septums. In the locking version it also locks the tray into the body of the Grafmatic so that the whole thing is locked up tight. In the older version this doesn’t happen and the tray is still free to slide in and out. Presumably this increases the chance of light leaks or accidentally ripping the whole thing off the camera or something equally drastic. So the newer version are to be preferred. So how do you tell the difference between the two versions at a glance? The answer seems to be in the screws on the side near the handle end. 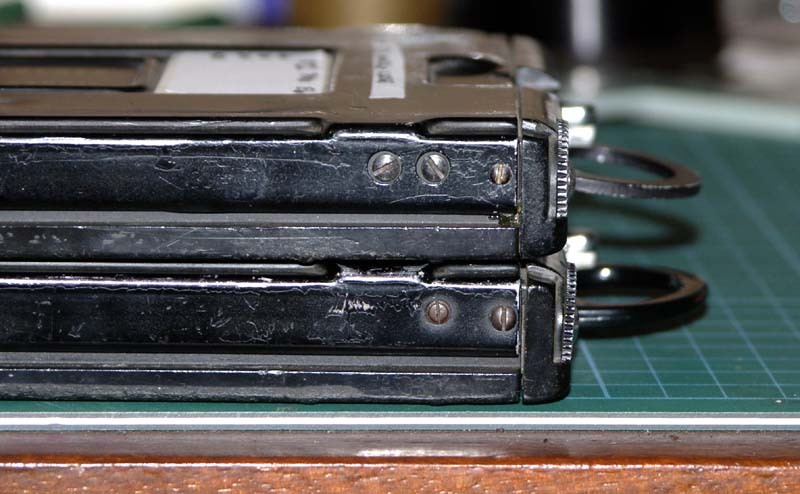 The older versions have three screws while the newer locking versions have two.